One of the things that makes cardmaking fun for me is that it's so easy. Still, I'm almost embarrassed to post this card, it was so easy! 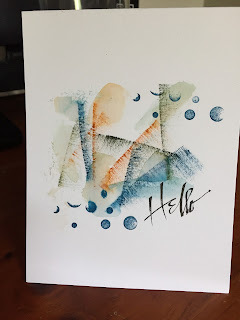 I was having stamper's block trying to create a card for this week's Less is More One-LayerSpots and Stripes challenge when I came across a piece of scratch paper I'd used to test some older stamp pads. Stripes. Spots. Lots of white space. Perfect! I created the stripes by stamping direct to paper, (masking the ends so they didn't look like what they were, rectangular ink pads), using Stampin Up! Not Quite Navy, Pumpkin Pie, and Always Artichoke. 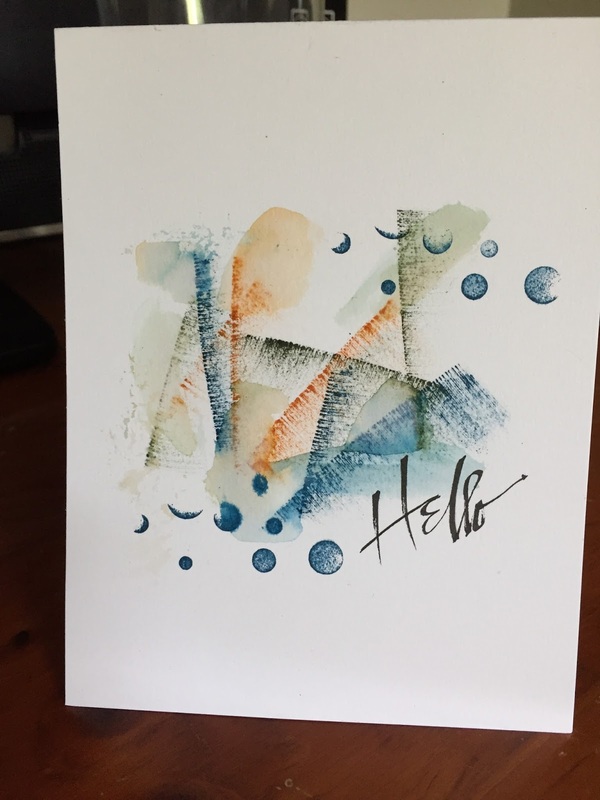 Then I took my aqua brush and created a little watercolor. The circles are from the vintage Simply Circles stamp set. I hand-lettered the sentiment with a narrow calligraphy marker. Fast and fun! Wow, you've been very creative with your spots and stripes! Who could have thought you made the stripes with ink pads! Such an innovative idea. Your hand lettering is stunning and perfectly placed. Thanks for joining us at Less Is More! Terrific card...very modern and beautiful. Thanks for sharing at Less is More! wow-what a great piece of scrap paper! Love how you used it. Hi Kathy, what a wonderful and great idea, this looks like a fantastic, modern work of art, which you can find in galleries! Hola Kathy, thank you for visiting my blog. Fantastic card!! !, It reminds me of an abstract painting.